As social media marketing continues to evolve exponentially, companies are finding this is one marketing area where constant change is par for the course. Keeping up with what's new and improved in the social media universe is a vital part of staying connected with clients, customers and new business prospects. New platforms, new technologies and new marketing channels are popping up as fast as you can tweet, click, like or share. To stay in the game, you've got to stay ahead of the newest trends … or risk losing out on profits, market share and business growth. This course was designed for marketers who are already familiar with social media, but want to gain every advantage they can out of their social media campaigns. We'll cover the latest advancements and newest initiatives that can affect your marketing plans and strategies, and reveal how to stay ahead of the curve when it comes to integrating social media with more traditional marketing efforts. 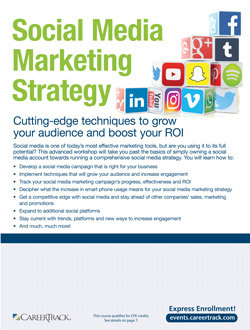 Gain cutting-edge information and fresh new marketing ideas you can put to use immediately! Google+™: Savvy new social networking tool or another Facebook wannabe? The impact of social media on individuals and organizations alike is tremendous. Don't let ineffective, outdated social media skills negatively affect your brand, your organization or your bottom line. Sign up for this workshop today, and harness the power of social media for the success of your business! What is Social Media Engagement? How should you go about ensuring that your site visitors "engage?" The value of entertainment: what's hot, what's not and when "enough is enough"
Understanding Social Media Advertising — Which platform is right for you? What constitutes "inappropriate use" of advanced social media? Brace yourself: change is coming! Are you ready to adapt?